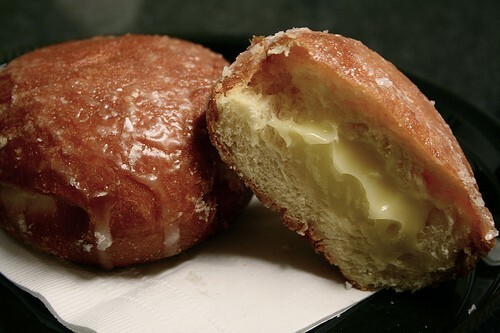 Wow, I think I should not have eaten paczki this year. In recent years, I've had the opportunity to eat just one of them, but this year, I could've eaten a few. I had one last week, one yesterday when a Polish student brought them to class, and was offered a fresh homemade one today--it had just come out of the oven--from my Polish boss. I was tempted to try it, but I was still feeling sick from the one I had yesterday. They are uber-doughnuts because they're rich and thick, and are usually stuffed with jelly, cream, chocolate, or anything else that's gooey and good. Some of them look like doughnut sandwiches because the doughnut is split in half, and there's so much filling inside, it oozes out like an over-stuffed sandwich. Even looking at that picture makes me feel nauseated because they're so delicious, but so sweet and rich. No wonder it's called Fat Tuesday (even though Polish people eat them on the previous Thursday). here's my blogreader bio: I taught EFL in Krakow for 4 years, so I'm interested in language issues and Polish stuff. The first one I was offered this year was on Fat Thursday and it was very tasty. I'll have to wait until next year to consume another, if I dare :D I've never been to Poland, but they say that Chicago (where I live) has the second largest Polish population. Thanks for visiting my blog.